* ed note: if you haven't already, be sure to read the first four chapters of "The Porch." So I walk out to smoke & Bruce & Bob are sitting there. "Hope it's okay that we made ourselves comfortable," Bruce says. "The cat said it was okay." I look at Puddy sitting in Bob's lap. "We didn't want to knock. Thought you might be napping." "Or drunk & passed out again," Dylan adds. I'm trying to come up with a clever repartee, but my hungover mind is not up to speed yet when the dead suddenly materialize. And when I say the dead I mean they've brought Jerry Garcia this time. "Mr. Garcia, this is our gracious host, Mr. Millsaps. I trust you know these other gentlemen." "Hell, yeah. We go way back." They fold out their chairs & we sit, apparently all glad to be here on this porch in Porterdale, GA, in spite of the fact that the president of the United States is making us ashamed of our country. "Mr. Millsaps," Leanard says, "I believe when last we were assembled you had us composing a song." "Yeah, I've rethought that. I'm afraid we might run into copyright problems there. I'm thinking we need to take this show on the road." Elvis says, "I've always wanted to go to Disney World." I don't want to stand in line. I'm thinking we should go to Graceland," I say. "Maybe we could write a song about going to Graceland." "We could have a problem there," Dylan says. "Bruce & I don't have time for that. Neverending tour, you know, and even if we did, we'd be swamped by people wanting to touch the hem of our garments. Ain't that right, Boss?" "I'm afraid Bob's right. As I understand it, only the magic traingle can see you guys. Millsaps might as well be invisible, but the rest of you literally are. Isn't that the case, Mr. Cohen?" "It is indeed, but let me try something. Messrs Springsteen & Dylan, would you be so kind as to each pluck out a hair for me." "Just wait a second & another one will fall out," Bruce say & Bob adds, "Why don't you just go through my garbage like everybody else," but they both oblige. "Now if you would hand those to me & step inside for a minute, we'll see." Once those two are inside the dead start to flicker like Captain Krk being transported. A staticky Cohen hands me the magic hair & everyone comes in focus. Dylan sticks his head out & says, "Your hocus pocus work?" "Yep. We're going to Graceland." This week's Da dishes will be gazpacho, cauliflower bacon salad & tiramisu cheesecake. At 1917 we give the best trivia prizes. The 1st place team wins a free dinner of their choice propared by me the following Wednesday (no teams larger than sic. I'm not working with loaves & fishes). The 2nd place team takes home a dessert of their choosing & the 3rd place teams receives freshly baked cookies. Last week's winners are this week having pork saltimbocca, red velvet cake, and oatmeal raison cookies. Let's see you match that Amici. Also, for $20, local businesses may sponsor a trivia event: show up to play & give a spiel about your operation or bring something typed up & I'll read it. Ellis was an attorney by trade (now recovering) but has worn many hats over the years: father, bus boy, stand-up comedian, novelist, wiffle ball player, rock'n'roll band manager, and at one time wrote a popular and funny column for The Covington News. A Fannin Co. mountain boy originally, Mr. Millsaps now stays at the mill village of Porterdale by way of 20 years in Mansfield. Usually funny and at times irreverent and subversive, he leans left in his political philosophy but can always be counted on for a pretty darn good write-up. The Chronicles are proud to have him involved. 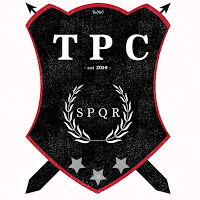 You can read his past works at TPC by visiting his Contributing Writer page.